Pause for paws…something you hear often in pet lingo. But what about those paw pads? Just exactly what makes them so special to your pet? In July 2012 an article posted by Nora Zelevansky on vetstreet.com quotes Dr. Tara Miller, a West Hollywood veterinarian. Dr. Miller states that “The pad is made up of hairless, pigmented skin overlaying a thick grouping of fat and tissue.” She also points out that the pads are “often tough in dogs who are exposed to rough surfaces, and more smooth and sensitive in cats and dogs who do not walk much or who are always on smooth, soft surfaces.” Your pet’s pads are their ‘shoes’, and as such provide stability when walking, especially on difficult terrain. Paw pads, and the webbing between them, can become cut or injured, which can ultimately lead to infections, so you need to always be careful to observe your pet’s behavior. Does your pet limp or have difficulty bearing weight? If there are abrasions, cuts, bleeding or swelling of the pad or foot, it’s time for a visit to the vet. Some dogs will also incessantly lick their feet and pads. There can be many causes for this, including allergies (food or inhalant), or this can be caused by stress or behavior issues. Again it is probably best to visit your vet to determine the cause of the continuous licking. If caused by allergies changes in diet or medications may be in order; if the paw licking has just become habitual then behavioral modifications may be tried. 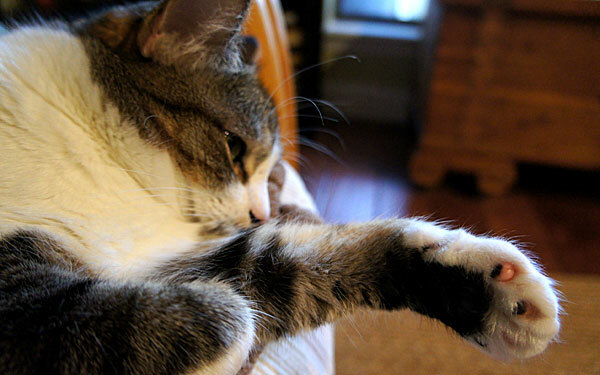 A pet’s nails should always be kept groomed so they don’t cause problems with the foot pad. If your dog has dew claws that were never removed they can be particularly prone to growing into the pad if not watched, as they do not get worn from use like the regular nails on the feet. If you just can’t get your pet, whether dog or cat, to cooperate with nail trimming have it done by a professional groomer. I know my dog HATES having her nails cut, but will allow me to shorten them more slowly with a small grinder made just for this purpose. This way I don’t ever have to worry that I will cut below the quick, which causes bleeding and is extremely painful for your pet. Did you ever wonder why your pet is able to withstand those freezing temps or romp in the snow without ever seeming to get cold feet? According to an article published in Veterinary Dermatology, anatomical evidence has been found to explain a dog’s tolerance to cold feet. Vascular casts and Indian ink studies showed that a vein–artery–vein triad is formed in the pad, creating a counter-current heat exchanger. When the foot pad is exposed to a cold environment, the counter-current heat exchanger serves to prevent heat loss by recirculating heat back to the body core, allowing the appropriate temp for the foot pad to be maintained in cold environments. Amazing! Wish my feet did that! Do keep in mind that even though a pet’s feet may be more tolerant to cold than our own, they can be damaged by rock salt or chemical ice melters used during the winter months. Vaseline can be applied to the pads on a dog’s feet prior to outdoor walks, or purchase some doggie booties – both stylish and protective! Here are some great ones sold on Etsy from jonisbarkery. I love that the soles of these booties have the same great Toughtek® product used on the base of my pet beds! 1. Hiroyoshi Ninomiya, Emi Akiyama, Kanae Smiazaki, Atsuko Oguri, Momoko Jitsumoto, and Takaaki Fukuyama, “Functional Anatomy of the Footpad Vasculature of Dogs: Scanning Electron Microscopy of Vascular Corrosion Casts,” Veterinary Dermatology, Volume 22, Issue 6 (December 2011): 475–481. doi: 10.1111/j.1365-3164.2011.00976.x. This entry was posted in Pets and tagged cat, Dog, dog booties, jonisbarkery, paw pads, paws, pet allergies, pet grooming, pet nails. Bookmark the permalink.